Last week the winds in the south made it impossible to safely launch the ROV at our intended dive sites in the Back-arc. We flipped our itinerary, and headed to the northern Mariana arc, where the weather was more favorable. It was a move that really paid off and we avoided any serious loss of dive time. You can see the amazing things we found in our first week highlights video here. 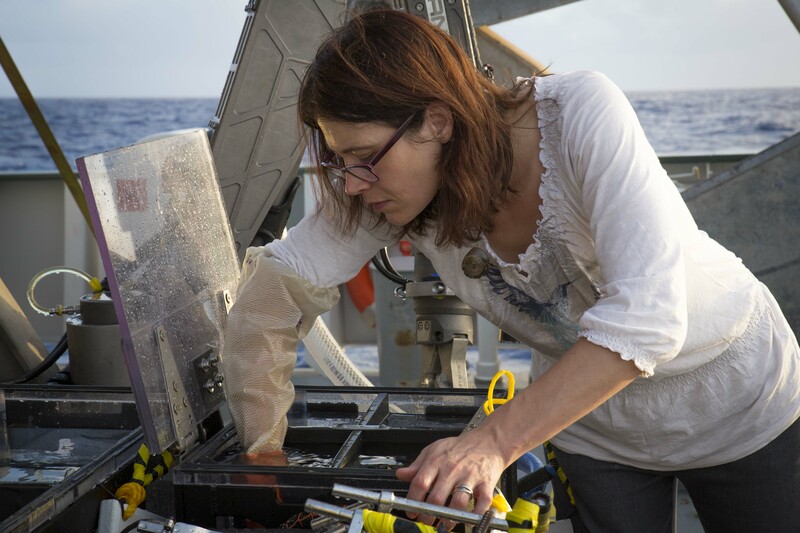 We already know the Mariana arc fairly well, and a big aim of this cruise is to improve our understanding of what’s happening in the relatively unexplored back-arc, comparing this new knowledge to what we know in the better-known arc. The Mariana region is where two of the earth’s giant tectonic plates converge, creating a subduction zone. Here, the Pacific Plate dives downward under the Philippine Sea Plate. As the Pacific Plate dives deeper it causes melting in the overlying mantle and that molten rock (magma) rises upward to feed a chain of active volcanoes, called a “volcanic arc.” In the Mariana area, the arc includes nine island volcanoes and over 60 submarine volcanoes called seamounts. So most of the action is underwater and usually hidden from view. Behind the arc in some subduction zones, like this one, there is a region where the upper plate is spreading along a linear zone. This is the Back-arc. It is thought that Back-arc spreading is caused by “roll-back” of the subduction zone. Effectively the trench is moving to the east and the upper plate has to spread to keep in contact with the subduction zone. 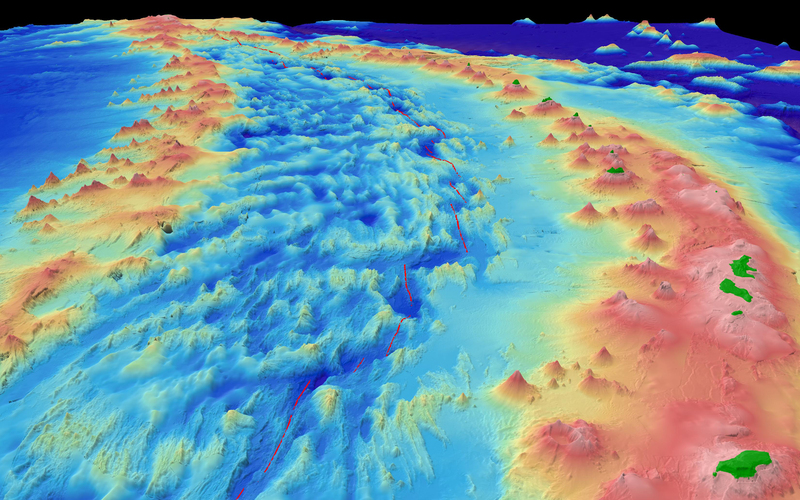 Caption: 3D computer-generated view of the seafloor in the Mariana region – purples and blues are deepest, oranges and reds are shallow; green are islands (Rota, Tinian, and Saipan are in the lower right). The pointy, red dimples on the right (adjacent to and among the islands) are active volcanoes of the arc. The red lines at center show the axis of the back-arc, where seafloor spreading is occurring. 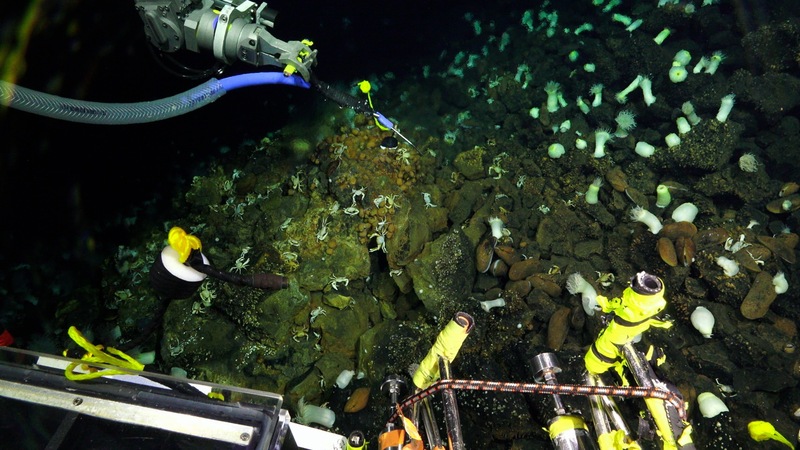 The active volcanism in this zone fuels the deep-sea hydrothermal vents we are hunting for. In the southern end of the Mariana Back-arc, where it has a high magma supply, the Back-arc looks like a narrow ridge that is higher than all the adjacent topography, which is around 3000 meters deep. However, further north where the magma supply is lower, the axis of spreading on the back-arc is along a series of deep basins, some as deep at 5000 meters. Because of this seafloor spreading, the back-arc is a zone of submarine volcanism, which provides the heat for hydrothermal vents. Muscles, squat lobsters, and barnacles cohabiting in the shimmer of a hot vent at Alice Springs. We have now made three dives on the Northern Back-arc sites around Alice Springs, these sites were last visited 20 years ago. We even spotted a few dive weights from previous explorations with the submersible Alvin in 1987! Whilst these man-made markers have not changed much in twenty years, nature has moved on. The first two sites seem to indicate a waning vent system, and we do not spot any of the high temperature venting that was previously reported. Nevertheless, there are some extensive, and stunning, low-temperature vent sites hosting beautiful landscape of anemones glowing under the ROV’s lights, a host of crabs, shrimp, snails and anemones living in varying proximity to the shimmering chemical hot springs. We are struck to witness some extremely brutal cannibalistic crab behavior. It pays to be tough down here… We get some great samples of the vent animals, good fluid samples and a variety of measures on several vent spots, before we run out of time in Alice Springs. More about the biology of the back-arc in a future post. ROV SuBastian’s temperature probe seeking a good spot for sampling the fluids at the hot vent. During our exploration cruise last year on Falkor, we surveyed a long unexplored stretch of the Mariana Back-arc and discovered hydrothermal venting areas on four Back-arc segments. Next we will return to those newly discovered sites with the new remotely operated vehicle (ROV) SuBastian and explore, sample, and characterize the sites for the first time. Everyone is excited about what new things we might find. Join us live on YouTube and together we will be the first to see these hidden deep-sea ecosystems. Follow us on Facebook and Twitter for the latest dive news and track the hashtag #HydrothermalHunt for updates, highlights, photos, blogs and links.